It’s always amazing to me how many people do not take advantage of two important benefits offered at many workplaces. One is the employer matching plan for a 401k distribution. Some companies are shying away from this form of savings but many still implement them and have replaced their pension plans with them. Briefly, participants of an employer-match program will receive a dollar for dollar match on money taken out of each of their paychecks up to a certain percentage that is then placed into a sponsored retirement plan (401k or 403b). Sometimes it is matched up to 12 or 20% of their pay. You can’t beat the compound interest these plans generate. Working in human resouorces, I found there were many employees who lamented that they could not afford to take even 2% out of their salary – they were on such strict budgets. In truth, they cannot afford to miss this opportunity to save and compound their nest egg for retirement. It is difficult for the first month or so to allocate this percentage in one’s budget, but it usually is compromised swiftly, especially if a later bonus or merit raise or cost of living raise equals it and offsets the contribution. I’ve written about 401ks before, but, my focus here is on tuition reimbursement from your employer. Even in these economy-challenged times, most employers want to invest in the employees they have and increase their investment in them by increasing their skills and value to the company. Many employees do not investigate or take advantage of this generous benefit either because they ‘don’t have the time to continue their education’ or they ‘don’t think their supervisor would approve it’. And again I say, they cannot afford not to participate in this truly gifting program. Having done this myself, I can vouch that although the company does benefit from an employee learning and increasing their knowledge in the relative discipline subjects and also in other subjects that round out their learning curve and experience, the benefit for the company can terminate if the employee moves on to another company. For the employee, the benefit is with him or her for their entire lives. Please repeat that last sentence – it is that important. Continuing education, especially if it results in a degree or certification, is equal to getting a raise at work – it puts dollars in your pocket and represents a life-long achievement. If your company provides tuition reimbursement, and you have not pursued this avenue, make an appointment with Human Resources (HR) today and find out what you have to do to participate. Generally, I can offer some provisions although they might differ among different companies and disciplines. Investigate – but here is some legwork you can do beforehand. 1] Decide what discipline you would like to be specialized in. If you want to pursue legal, look into paralegal or business law courses. If you are in technology, perhaps you would like to take courses for the next level – routing, international analyst, technology engineer or site administration. If you work in accounting, perhaps you would have an interest in CPA or payroll administration. 2] Look into the different courses and colleges that offer these courses and what their entrance requirements may be. You should find this all online or at the library. Also, you can check on in-house courses (traditional classroom) or on-line or distancing courses that you can take at home. Find out if the school offers them. On-line education is very popular today; some even get masters and/or doctorate degrees on them. 3] It’s important to have a plan of what you want to do and a possible avenue of options. This will give you more credibility of ambition with both your supervisor and HR when you approach them that you would like to take advantage of this opportunity. It is helpful if you list the reasons why you want the additional learning and what courses you feel would accomplish it. Do this if you want just one course or if you have a degree in mind. Your ambitions may change midstream. 4] Approach your supervisor first. He or she has to approve your application. Appeal your case, explain your justification of how it will help both you and the company. **Keep in mind, that companies rarely turn down requests for continuing education. This includes a one-course class or a specified degree. This is a benefit that they offer. You are responding – not asking for special favors. 6] When your application is approved, you are either ready to sign up for the one-time course, certification, or call the college of your choice for an interview and plan your curriculum. • You may have to be a full-time employee; (some offer to permanent part-time employees). • Be on the payroll when the course is completed. (if you are let go or outsourced by the company during that time, they usually reimburse for that semester but not if you quit or leave the company on your own). Most companies will reimburse employees for all tuition expenses – most include entrance fees, books, and supplies). There usually is a maximum of how many credits a year for which they will reimburse (anywhere from 3 to 6 courses a year – some companies will allow 3 courses a semester or 12 total courses for the year including summer couses). 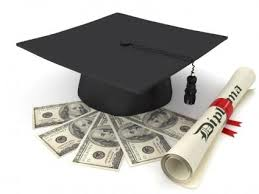 *NOTE: Credit fees are the highest costs associated with returning to school and vary according to college. This is where you are getting a big ‘raise’. I recommend no more than 3 courses a semester if you are working a full-time job. I also recommend one heavy-duty course (Statistics) and a required medium-duty course (Psychology) and an elective (something you like that is included in your requirements, ie, Art, Music, Philosophy, Poetry). It is important to keep in mind that you don’t want to be overwhelmed or overworked; you have to PASS the course to be reimbursed. No reimbursements will be made for grades lower than a “C” grade and no reimbursement for Fail. Certifications, Associates, Bachelors and Masters degree programs are part of reimbursement if they are business or job related. All courses, required and elective, which are related to an employee’s work or which lead to a business-related or job-related degree will be reimbursed. Most companies will reimburse as long as you PASS with ANY GRADE. *Note: Many employees start with courses related to their present discipline or department they are working. Sometimes they are courses offered at a certification seminar or at a community college or even online. As the ‘student’ seeks additional courses, they may seek courses at a university or college. Once they matriculate, (admitted or accepted by a college or university for a defined degree course), the employer WILL accept variety of courses. The major will usually be business; and the minor may not be business-related, but part of the overall courses needed for the degree. Most companies do accept these unrelated courses as part of the degree program and reimburse for them. Upon completion of the pre-approved course, the employee must submit a copy of the “Request for Tuition Reimbursement” form to the Human Resources Department, along with an official transcript of grades and proof of payment. Requirements vary among companies. Top photo: even the steps are made out of their famous ceramic tiles. Middle & last pictures are from Caltagirone's well-known Natale decorations in each house (you're invited to see them) in the village. Located in central Sicily, Caltagirone is one of the most lively Baroque towns well-known for its thousand-year-old tradition. Prehistoric earthenware has been found in the surrounding hills, local potters were world famous during the Middle Ages, and today the tradition is still maintained. The famous Santa Maria del Monte Stairway, built in 1608, where each of the 142 steps is decorated with majolica tiles, and at the top of the steps is the former Cathedral of Caltagirone. 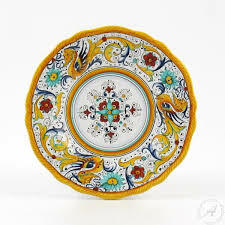 Ceramics are featured in most houses in Sicily and have been used for centuries to decorate parks and churches, streets and squares. The typical colors of local pottery, sage green and yellow, are the colors of Sicily itself and prevalent in its ceramics. Caltagirone has been inhabited by prehistoric man, Greeks, Arabs, Romans, Spanish, French and various post Roman, city-states. The city is well known for its artisans who create the luxurious ceramic works of art. 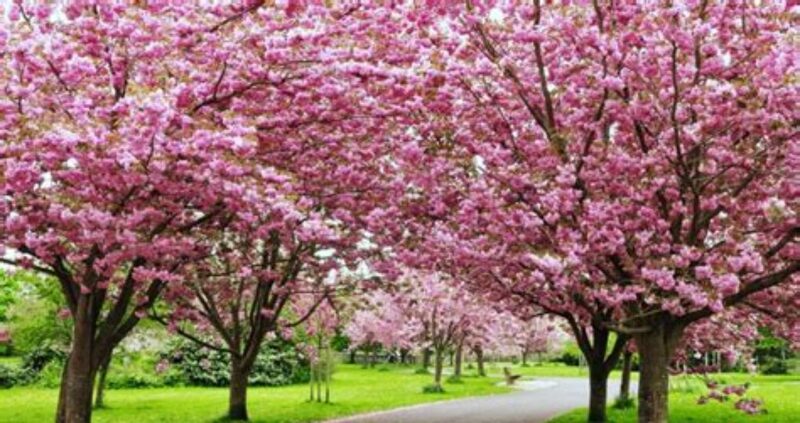 The tradition dates back to the 5th century BC. The city is host to the Museum of Ceramics and the timeless pieces can be found in every building. A visit to the Regional Museum of Ceramics is a must to appreciate the artistic value of Sicilian pottery and its evolution over the centuries. We visited Caltagirone on a wet, winter day the week of Natale or Christmas. 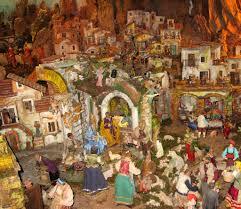 Christmas is a special time to visit here as shopkeepers, establishments and homes display ‘Natale a Caltagirone. These animated displays, many of them religious in nature, have been handed down for generations and are a sight to behold. 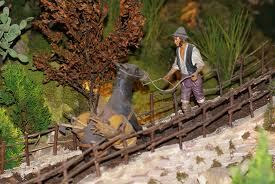 They are to scale and some portray the different occupations in Sicily – herders with miniature goats or sheep coming down a mountainside; fruit growers working in agricultural groves of oranges and lemons; farmers picking up pails of water and watering their field; fishermen making a ‘catch’. There are multiple animations going on at the same time. You could spend all day here and we did. Each one is different and each one is beautiful. There is even one that is a miniature copy of the famous Santa Maria del Monte Stairway’s ceramic steps – and the miniature has ceramic stairs, too! There is minute detail and just when you’ve seen it all, you glimpse one that you missed. The displays are only shown at Christmas time that we were there at the right time to see it. http://www.youtube.com/watch?v=nasMw259Qks this video shows the town of Caltagirone and some of the Christmas miniatures that adorn all through the village including the one with the miniature ceramic stairs – looks just like the real one. Sicily and Italy are famous for their espresso bars and cafes located on nearly every corner. 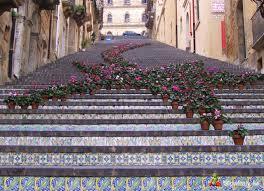 In Caltagirone, the espresso cafe is adorned in their famous ceramic tiles and colors. It is all along the front of the espresso counters and up on the ceilings. It is quite a sight to behold. Even the street signs in Caltagirone are made of ceramic tiles. As you walk along the village, you get to see the artisans at work in their shops and exhibiting their wares. You can get a really good price on ceramics here as compared to a large city such as Siracusa or in Rome. Each ceramic piece is sold with cards of the artisan’s name and address. 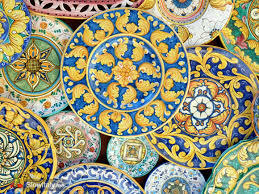 All bonafide Caltagirone ceramic pieces have the painted name ‘Caltagirone’ on the reverse side. Along with small ceramic dishes, the sizes (and prices) of ceramics get larger and larger – with very large plates for wall hanging or ceramic top tables. The ceramic tables are usually round-sized and are popular in Sicily. They are used in a corner of the living room along with matching chairs for espresso time and/or for entertaining company. They are breathtakingly beautiful and a functional as well as striking addition to any room. The villages, towns and cities of Sicily observe and celebrate a particular saint’s day that has meaning for their town. These celebrations are marked by processions through the towns by the villagers who sing and carry candles. The saint of Caltagirone is San Giacomo. The city celebrates with a festival called the Luminaria. The Luminaria is celebrated on the nights of July 24th and 25th. Thousands of lanterns are used to decorate the , staircase, creating a spectacular atmosphere. Also, a visit during the period of the ‘winter fog’, an impression of the supernatural is created as the clouds settle around the inner walls and the city becomes part of the mountain on which it sits or appears to be a city floating in the air. There are over 100 U. S. military bases in Italy and there is one not far from Caltagirone.